Why is it important to recognize Lunesta addiction signs? Lunesta is a powerful sleep aid that can lead to dependency. It’s important to understand Lunesta addiction because it can result in risky behavior and overdose. All this can be fatal to the user and the people around them. If you notice that your loved one is sleepy, confused and isolated, that might indicate an addiction. Therefore, always seek help. Sometimes it’s hard to admit that you use drugs. Even so, sometimes it’s even harder to recognize the fact that you might have an addiction to your drug of choice. 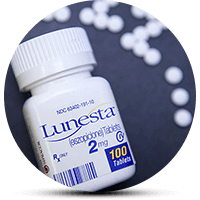 Lunesta, or Eszopiclone, is a powerful non-benzodiazepine hypnotic-sedative used to treat insomnia. Lunesta acts as a central nervous system depressant. Thus, it helps many people lead a better life and makes them forget about their sleepless nights. Though, as a trade off it improves their cognitive performance the day after taking the drug. When used for an extended period, however, users can quickly become addicted. Some symptoms are vivid hallucinations and feelings of relaxation. Not surprisingly, Lunesta is a Schedule IV Controlled Substance. Then you should admit that you might have a drug problem and seek help. In addition, vomiting, body aches, hiccups, headaches, sweating and high blood pressure are also Lunesta addiction signs that require treatment. The Dangers of Lunesta Addiction: Why Is It Important to Identify It ASAP? If you continue using Lunesta for an extended period, it might be harder to quit. That’s why it’s important to recognize Lunesta addiction as soon as possible. Lunesta addiction can cause uncomfortable withdrawal symptoms that might make you less confident in your ability to get clean. Sweating, tremors, cramps and fatigue are some of the withdrawal symptoms one should deal with while Lunesta is leaving your system. Usually, withdrawal is a definite sign of addiction. Metallic taste and drowsiness, on the other hand, are common Lunesta side effects, which can affect your everyday life. Impaired judgment and sleepwalking can lead to risky behavior that can be dangerous to the user and the people around them. Always go to bed and dedicate at least 7 hours to sleeping after Lunesta. One of the biggest dangers of Lunesta addiction consists in the fact that sleeping pills can be lethal. Overdosing on sedatives can happen by accident, especially when mixed with alcohol. Difficulties breathing, coma, and extreme sleepiness can be fatal. Note that Flumazenil is used in the case of an overdose to counteract the effects of Lunesta. So always mind that Lunesta can put you to sleep forever. In addition, many people use Lunesta to commit suicide. A study shows that out of 15,213 patients on Lunesta, 71 committed suicide. 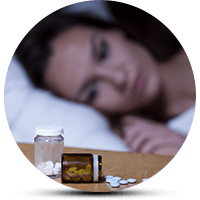 The scary fact is that more than 9 million Americans use prescription sleeping pills. Lunesta Addiction Signs: How to tell that your loved one is addicted to Lunesta and needs help? For teens, drop in grades, mood swings and low interest in appearance and social activities might be a sign of addiction. Sometimes finding many pills or prescriptions indicates abuse, which can easily lead to addiction. If you find that your loved one is addicted to Lunesta, like with any other addiction, don’t be judgmental and try to create a loving environment that will help your loved one open up. First of all, suggest counseling that will explore the reasons that have led to abuse and dependency. Professional help is a must. The first step towards a clean life is detox. Tapering off is recommend instead of going cold turkey as rebound symptoms won’t kick you too hard. Inpatient Rehabs are an excellent option as experts will monitor you 24/7. Also, there are many outpatient and individual programs that are beneficial. Behavioral therapy, support groups, family counseling, and aftercare should also be provided for the addict to restore their social, work and family life. Also, as Lunesta affects the processes in the brain, some holistic methods might be applied to regulate the normal sleeping patterns of the user. Yoga, regular exercising, healthy diet and moderate caffeine intake are helpful for people who suffer from insomnia. Users report that meditation is very useful when it comes to sleep regulation. Sometimes during detox, anxiety can become a problem and some experts might use medications to control the stress and anxiety levels of the patient. Also, other comorbid disorders should also become a primary focus of treatment. In conclusion, even when prescribed by a health expert, Lunesta can lead to addiction. In the end, pharmacology nowadays is more about money, not remedies. Note that since 2004, there were 31 million prescriptions written. If you think you have an addiction to Lunesta or if you are suspicious that your loved one might have an addiction to it, do not hesitate and seek help. But first of all, be open and supportive. There’s no need to sleep off your problems.